Did you know that our Hall of Honor on the wiki is where we keep all the information about our awards ceremonies, in character service ribbons, and out of character badges? Bringing together all of the accolades we give out to both our players and our characters, the Hall of Honor is an exhaustive resource with detailed records on who has won awards and what each award means. If you haven’t spent some time browsing through our awards section, you can learn more about the history of this group tradition, reading ceremonies all the way back to the 90s! And our service ribbons area explains each ribbon your character can earn, with detailed information about how to add your character’s service ribbons to your character’s wiki profile. Click here to head to 118Wiki and browse the Hall of Honor now. We first brought our wiki online in 2004 and since then have been building out a vast store of knowledge both about the In Character universe we write, but also about the Out Of Character community that we’re building. Nearly any question you have about how our group works can be answered somewhere on the wiki, as long as you know where to find it! In this month’s wiki highlight column, we’re focusing on the Intelligent Lifeform Index. Click here to open this area on the wiki and take a look. This is a resource that many, if not all, of us referenced when we first joined UFOP:SB118 and decided on a character to play. But have you looked recently at this often-updated and expanded list of species in the Star Trek universe? From fleshing out well-known species with small details gleaned in our own gaming universe to entire civilizations that were created solely by our members, this resource is one-stop shopping for species information! In this month’s wiki highlight column, we’re focusing on the Galactic Atlas. Click here to open this area on the wiki and take a look. Star Trek’s galaxy of the 24th century is well explored and well mapped, and this is a valuable resource to help integrate some of that lore into your writing. Learn about the quadrants and the major players within each one, explore the star systems that make up the Federation and other political entities, and check out the many informative star charts at your disposal. There are even detailed write-ups on the campaign regions that each ship and installation of UFOP:SB118 inhabit. Take a look at the map and see where your ship or base is located in regards to the rest of the fleet! In this month’s wiki highlight column, we’re focusing on our duty post area. Click here to open this area on the wiki and take a look. If you’re looking to improve your writing when it comes to how your character performs their job in Starfleet, the duty post area of the wiki is your first stop. Over the past 15 years we’ve built an incredible resource for each duty post that members can play, providing detailed information about what characters in each role do, the courses characters would take at the Academy to end up in this role, and much more. You’ll even find a list of the officers in each duty post who are currently playing in the fleet, as well as links to the Memory-Alpha pages of characters from each Star Trek series who played those duty posts, so you can read more about what their characters were like, what their backgrounds were, and anything notable they did on the show that could help inform your own character’s growth and development. Learning how to play your character’s duty post is an important part of the promotion process, so take a few minutes today to browse the duty post area relating to your character! In this month’s wiki highlight column, we’re focusing on the in-universe timeline. Click here to open this area on the wiki and take a look. With a group that’s been around as long as ours – nearly 24 years! – you start to amass a lot of detailed storylines going way back. That’s why we put together a page on the wiki where you can help track some of the major events that have happened in our universe and refer back to them both in, and out of character. And if you’re a part of an event that you think should make it onto the timeline, be sure to read the guidelines on the page and make the addition! In this month’s wiki highlight column, we’re focusing on the Writing Improvement Team area. Click here to open this area on the wiki and take a look. Over the years, we’ve amassed a tutorial library of writing tips that can help you improve your skills. Some tips even come from published Star Trek writers who have made guest appearances at our special events! These tutorials range from information about proofreading to writing alien species in a fun and realistic way. Check out the wiki area to learn more and read through at your leisure. In this month’s wiki highlight column, we’re focusing on the Utopia Planitia Fleet Yards. Click here to open this area on the wiki and take a look. We have dozens of ship types, separated into categories, with detailed information about each class including stats on defensive and offensive capabilities, photo galleries, and the list of ships in our fleet in that category. Learn more about each ship class, the ships in our fleet, and even historical information and non-Federation ship classes! Ever wondered who owns a character? Or where a new character came from — only to find out after a lot of searching that it’s someone’s secondary character? Well, we’re trying to fix some of that confusion while helping to build our definitive member director for everyone’s reference. And we need your help to make sure it’s complete! First, check out the new Member Directory on the wiki. The first page/tab of the directory is the the Fleet Roster you all know and love. The second page is a new comprehensive listing so far of all the members organized by your Writer ID number. The table is a sortable table, meaning that you can click on any of the column headings to sort it by that column, so for instance, clicking on the primary character column will sort it alphabetically by first name. You’ll also note a link next to the ID number; that link should go to your user page. 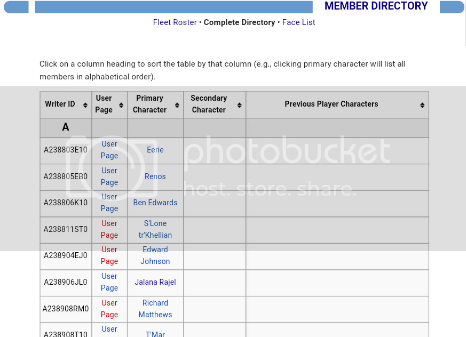 We’d like to encourage more use of wiki user pages, which we feel have been underused because they weren’t easy to find before (unlike our characters’ pages, which we all could find from the Fleet Roster). This is where we need you! This is because the links are actually linked to your ID number. Typing in your writer ID will then send you to your user page. Then we encourage you to make one! You can copy the code from any page like those above and paste it into your own, and then begin filling in your own information! Pop into the WIKI HELPDESK, or the chat room and ask your question. In an effort to simplify administration of the wiki, the Wiki Ops Team is implementing a change to the page naming conventions. We’re ditching the long-standing “backwards” page names for characters, like “Wolf, Tristan” in favor of a clearer and more straightforward format that more closely matches other wiki. The Wiki Ops Team will slowly be making this change to existing character pages over the next two months. New characters should be named this way going forward. Characters that are currently inactive in the fleet do not need to be renamed, but can be on a case-by-case basis as time and desire permits. Title characters “First Name Last Name,” like: “Tristan Wolf“. If your character is a Bajoran, such as Kira Neyrs, even though Kira is the last name, you would title it Kira Neyrs. The same goes for any culture where last name first name is written. Like so: “Ishikawa Keiko“. Of note, you should probably not include middle names. It is exceeding unlikely they will be commonly referred by it. Clones get (clone x), where x is the number. Try to resist putting descriptors there – for example, if you have Tristan Wolf (good clone), and the clone becomes evil, that name may become confusing! Double characters (such as Bynar) should get something like 11001010 (01010111) to indicate they are a double character. For more information on our page-naming convention, see the “naming pages properly” article on our wiki. Awards are an integral part of the Starbase 118 experience. While we work hard to sim and weave a story that brings our imagination to life, acknowledgement for tackling some of the more difficult aspects of story building, or getting recognized for contributions that help our community grow are something everyone looks forward to. And now, it’s easier than ever to make sure that you and your characters can shine by sharing the ribbons and awards you’ve earned! Whether you’ve earned an OOC award or your character has gained a new Service Ribbon, players now have options on how to display their ribbons. While the ribbon ‘rack’ for character sidebars has been around for some time, our Chief of Wiki Operations has devised a new way to show off OOC awards on your user page. By simply copying and pasting some specialized code, players can create a professional looking ‘case’ for their ribbons and awards. Complete with a nice wooden finish, the case allows you the ability to include the image of the award, the name of the award, the year that it was awarded along with the ship you were assigned to when the award was received, and the text of the citation that often accompanies both IC and OOC awards. There are even multiple ways to implement this new addition to your user page or character page as well, including simplistic formatting, as well as something more descriptive using wiki markup code. Like many aspects of our wiki, the case that you create can be as simple or as elaborate as you desire! With a finish to match the beauty of our award ribbons themselves, this is another great way to show your amazing contribution to the 118 fleet. Complete instructions on how to implement this special code are located here. And remember, if you run into any trouble, don’t hesitate to ask questions. Our Chief of Wiki Operations welcomes them here.